There are no large impersonal chain hotels on Santorini. 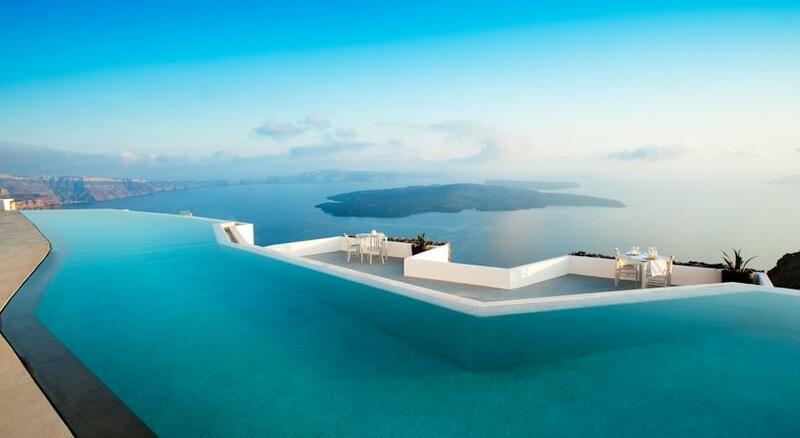 There are no all-inclusive hotels or mega resorts in Santorini. 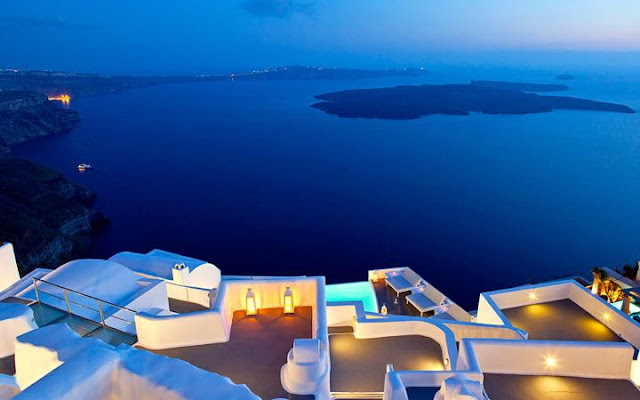 The towns along the caldera on the west side of the island (Fira, Firostefani, Imerovigli, and Oia) are where you’ll find most of the five-star hotels on Santorini. The views and settings in these 4 villages are magical. It’s easy to walk between Fira, Firostefani, and Imerovigli but Oia is a two-hour hike (or 10 minutes by bus or taxi) north of Imerovigli so feels like a separate part of the island. 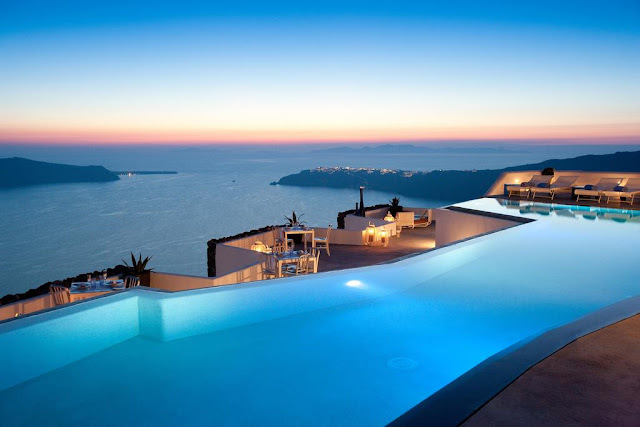 Of any destination in Europe, Santorini is the one place where splurging on a great hotel is money well spent. In so many destinations (Paris, London, Rome) you spend a majority of your day out and about. 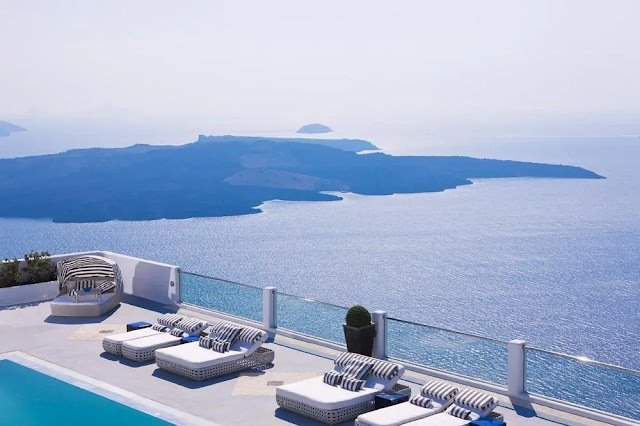 But in Santorini, with those incredible views, it’s common for people to spend a good chunk of their holiday lounging on their deck, jaw dropped, staring out into the caldera. Click the hotel name to check prices on Booking.com (my favorite website for hotel bookings). Book 6 to 10 months in advance for the best rates and rooms. The best hotel on Santorini. 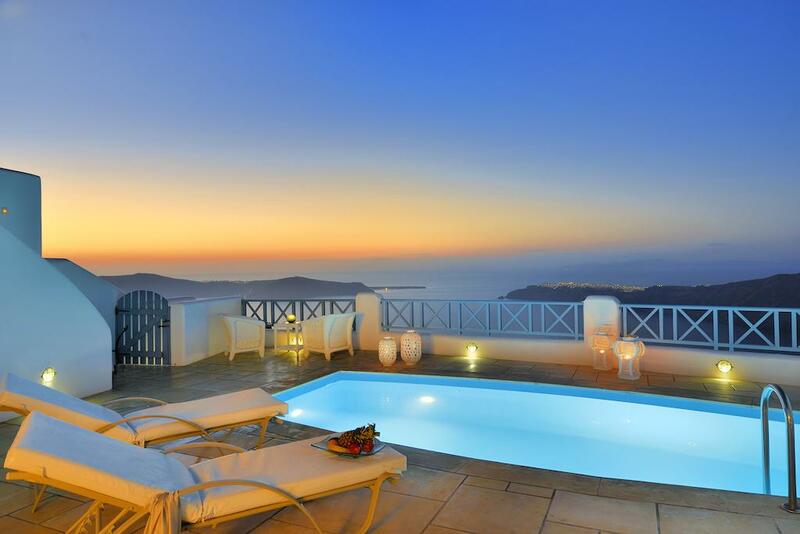 It has amazing views of the caldera and sunset Picturesque white washed cave suites. 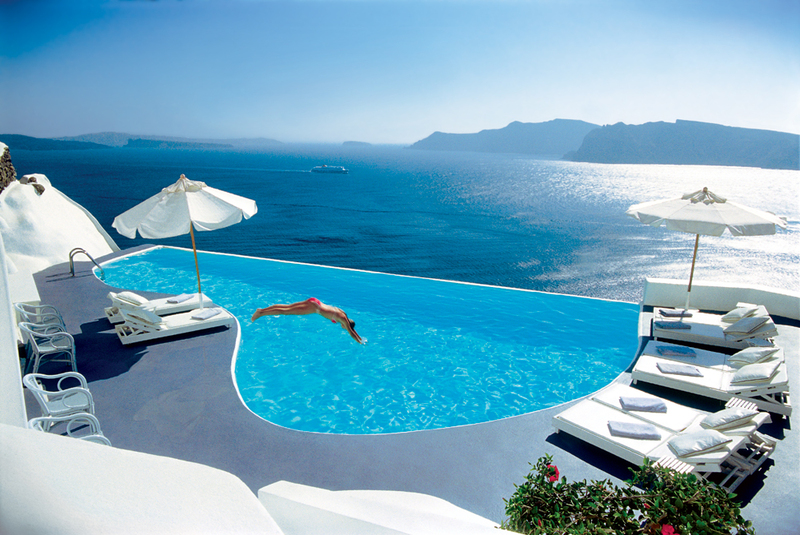 The pool overlooks the caldera and has a pool bar. Some suites have a private pool. The magical 3-bedroom villa sleeps up to 7 and has a full kitchen. The restaurant is one of Oia’s best and the hotel has an elevator. And you guessed it right: you probably have to book very well in advance. Probably months or even more than a year before your arrival. Katikies is the best hotel in Oia. 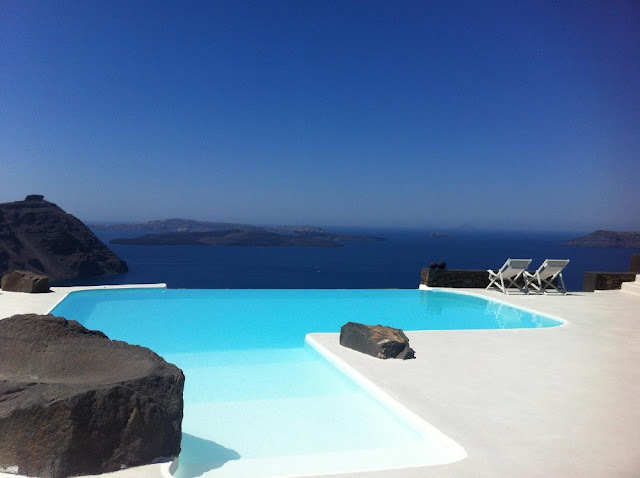 Trendy vibe, great location (easy access by taxi unlike some of Oia’s hotels), 3 swimming pools, wonderful breakfast. Their intimate restaurant is one of Santorini’s finest and has only 4 tables. Katikies is one of the few hotels in Oia that has an elevator if you’re worried about climbing steps. 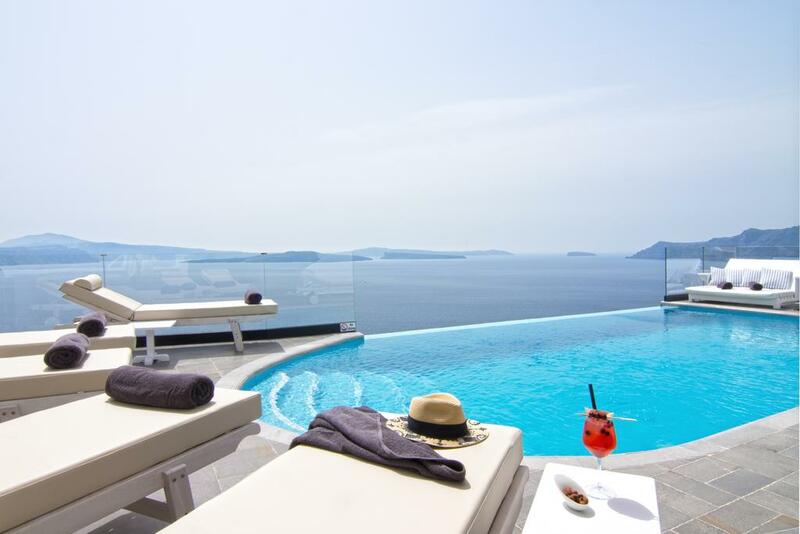 Many magazines have called Astra Suites the best hotel in Greece and it’s hard to summon much of an argument. Suites are huge and beautifully decorated. All have a kitchenette and private terrace. 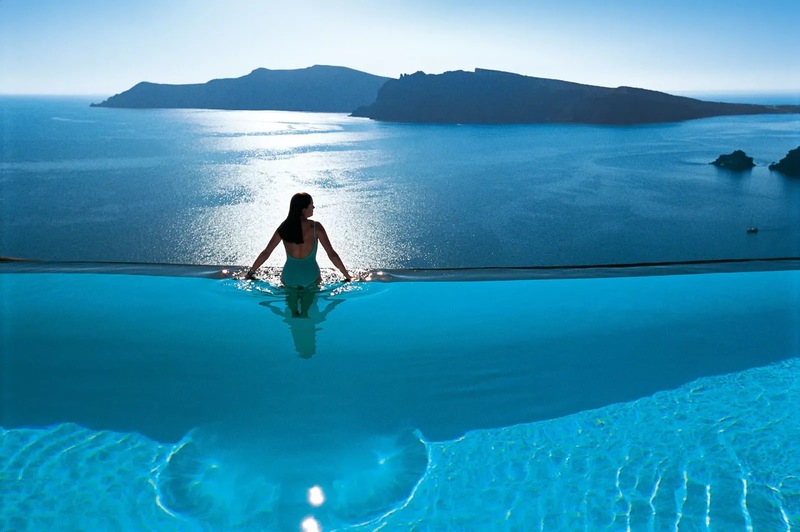 The infinity pool looks out into the caldera and sunset views are among the best on the island. 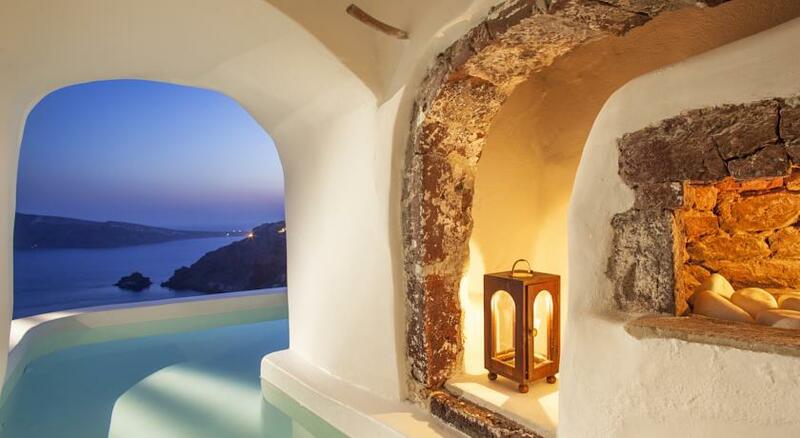 Cave hotel with minimalist design, incredible infinity pool, and greats views. Every suite has a kitchenette, some have private pool. Run by 2 energetic owners (George and Eleni) who are filled with passion, charm, and helpfulness. This is a magical little hotel with fantastic views, suites, and service. And rare for Santorini: few steps and little climbing are required to get to and from the hotel. Nice pool too. This is a stunning hotel. If you want quiet and seclusion with amazing views and infinity pool then this is the place. The perfect hotel for a romantic honeymoon. The only caveat is that there’s not a lot nearby – there is a bus stop just out the door but most people will want to rent a car if they’re serious about sightseeing. The walk to Imerovigli is a gorgeous 40 minute hike along the caldera path (and Oia is 50 minutes in the opposite direction). 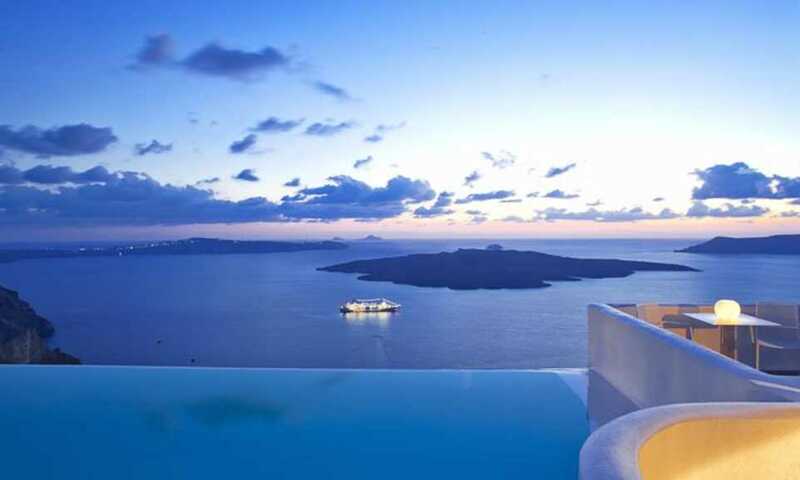 Santorini Secret Suites & Spa clings to the cliffs, overlooking the volcanic caldera and the transparent waters of the Aegean Sea. 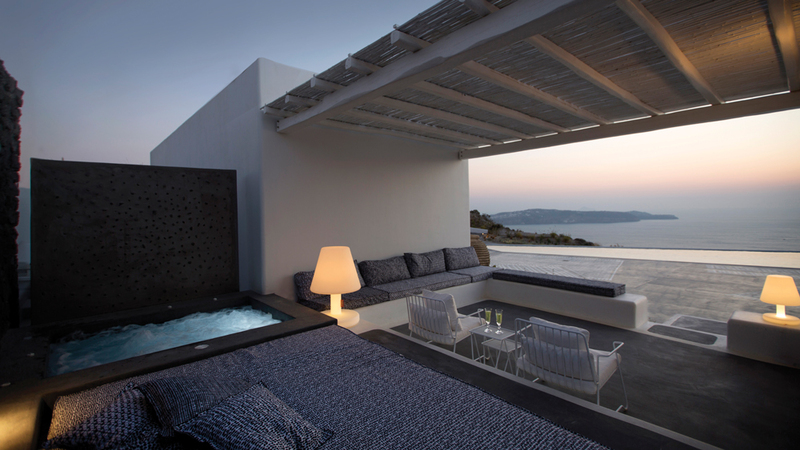 Each of the 18 super-sleek suites, has a large veranda with a private pool or Jacuzzi. 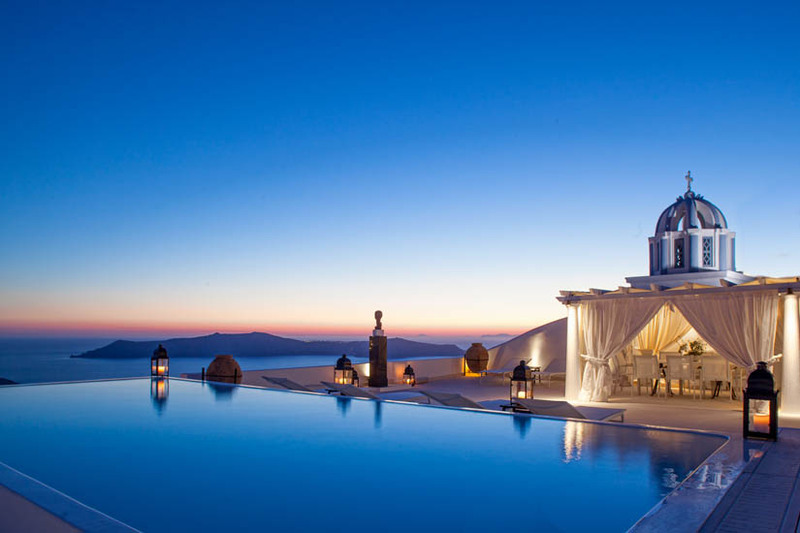 An excellent fine dining restaurant, an infinity pool and a spa add to the magic of this place, set in enchanting Oia with its famous blue-domed churches. Long one of the island’s best hotels the recipe is still the same: great views, nice pool, fantastic service, and beautifully decorated suites that cascade down the side of the cliff. Every room has a sea view and private veranda. The Chromata and Honeymoon suites are pure luxury. 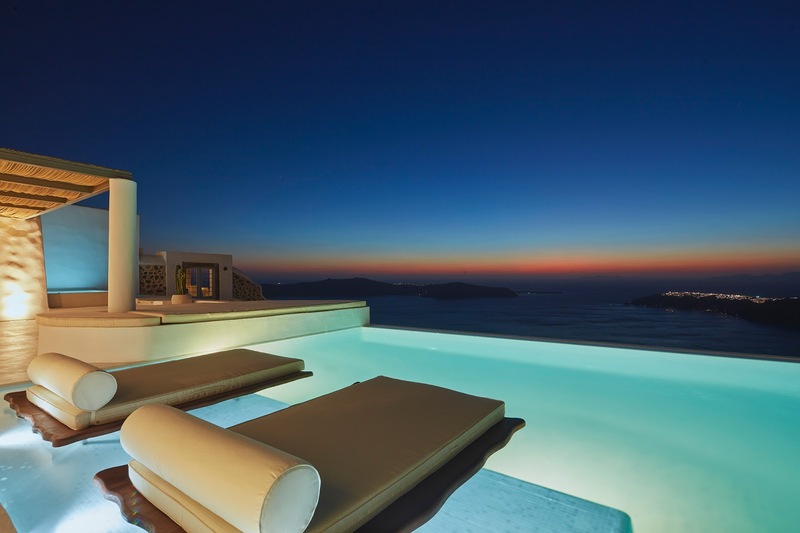 Great location in the heart of Fira and one of Santorini’s best infinity pools. The suites are not huge but at Cosmopolitan it’s all about the views, location, and pool. The 2-bedroom villa is wonderful and good for a larger group or family (but kids have to be older than 13). Nightlife is steps from the front door. I love this place. 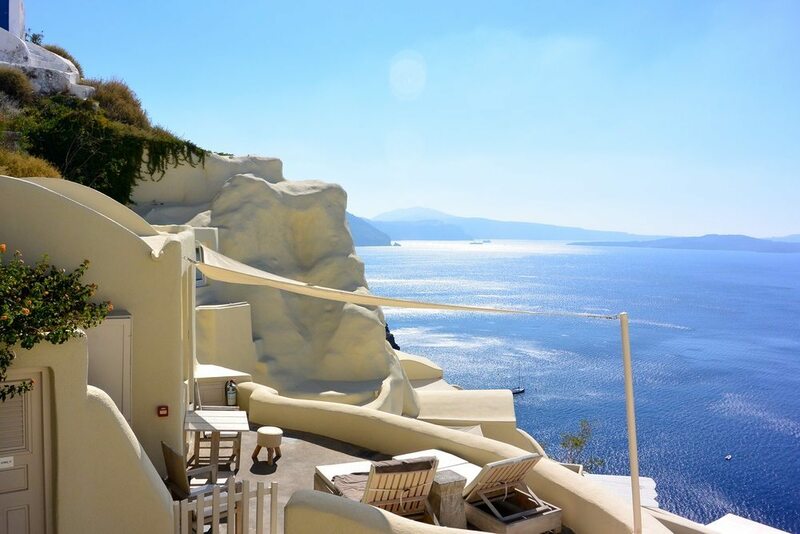 Incredible views, great food, private terraces, one of the quieter hotels in Oia yet still walking distance to the center of town. Ikies is in a quiet location at the south end of Oia (just beyond Perivolas). There’s a small pool and some rooms have private patio and jacuzzi. The full breakfast is made to order and delivered to your terrace. Suites come in a variety of sizes. Views are amazing. Large suites, all with private balconies and views, some with jacuzzi. Breakfast served on your balcony. Honeymoon suites are worth the extra cost. 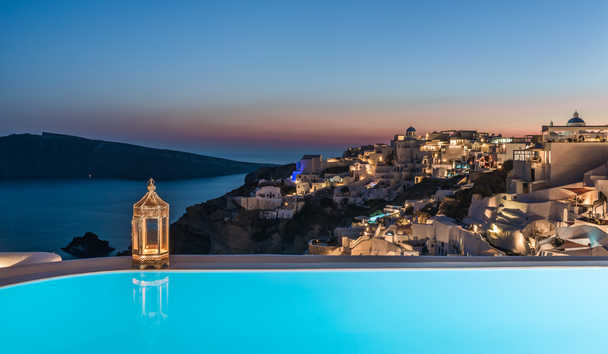 Brand new hotel and immediately one of Santorini’s best places to stay. Incredible views of the caldera and sunset (looking north towards Oia). 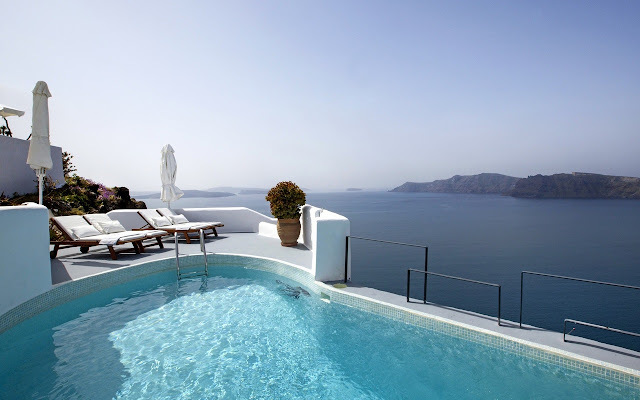 All suites have private hot tub or plunge pool and face the caldera. Pool is awesome and bar/restaurant has a hip trendy vibe. Located in a remote section along the caldera about a 15 minute walk north of Imerovigli. Views and location are 5 star. Rooms are not in the luxury category but still nice and good value. Suites are worth the extra money (for the view). 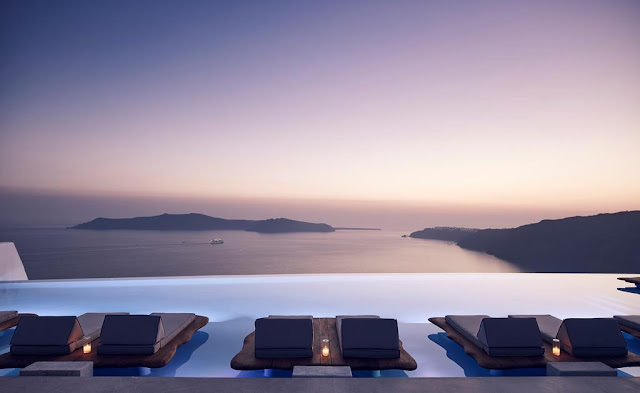 Erosantorini is a stunning private estate perched on the caldera, offering all the services and facilities expected of a five-star hotel. Take advantage of the concierge to take care of the little things, and trust the private chef to make mouthwatering dishes for every meal. Need extra help to relax? Call the personal trainer or masseur for a wellness massage or a sweat session. Finish the day at the pool terrace, and feel on top of the world. A view over the caldera, spacious terraces, a beautiful infinity pool and all-white interiors. Aenaon Villas, a hotel that resembles a members-only resort more than the charming family-run hotel it is (a rarity in the area), is where to find a home away from home. Combined with an elegant architecture and expert services, and it’s easy to understand why the Aenaon Villas complex is a favorite option for accommodation in Santorini. The earthquake of 1956 severely devastated Imerovigli, a 300-year-old town in Santorini. But a love for this picturesque village inspired a couple to renovate and reconstruct the old houses that survived the catastrophe. This is how Kapari Natural Resort was born. Consisting of a dozen of troglodyte houses built amphitheatrically, the resort, listed under the National Geographic’s Unique Lodges of the World list, is a thorough illustration of Santorinian architecture. With a warm and friendly staff, feel at home in this small yet luxurious resort, and experience Greek hospitality and some of the island’s best dishes. This list is manually curated and based on hotel recommendations from blogs and magazines. Please let me know if you think a hotel should be added to the list.